From the Würm ice age seventy thousand years ago when the waters of the Adriatic first began to recede to the turmoil of the French Revolution and the dawn of the Napoleonic era, Story of a Mercantile Empire will take you on an enlightening journey through the history of the world’s greatest trading nation. Along the way, you'll retrace the urban and architectural development of the city and discover its singular role in the evolution of world commerce. We'll begin our adventure at the gondola building yard almost sixteen hundred years ago when the roots of Venice formed. As we visit the workshop and discover how the natural environment was originally created and later affected the development of the city's traditional boats, we'll also talk about the genesis of the first permanent human settlements and about early life on the Venetian Lagoon. Moving on to the banks of the Grand Canal, we'll then see how the primitive economy evolved as the Venetians began to venture onto the open sea and learn about the distant origins of the city's noble families. As we wind through the back streets, we'll also talk about construction techniques and building materials and about the urban development of the Rivoalto settlement as it grew and became the city of Venice. The people and events of the decisive ninth century will then take center stage. We'll witness the clash of two empires as they seek to control the emerging city and discover how the intense theological debates in distant Constantinople led to the creation of a Venetian national identity around the relics of the evangelist Saint Mark. At our next stops, we'll see Venice expand its dominion from the slopes of the Alps to the shores of the Black Sea and penetrate into the heart of the Mongol Empire. We'll discuss the economic interests that dictated Venice's policy of expansion as well as the tremendous commercial importance of Marco Polo's travels and the role of Asian technology in the growth of European manufacturing. We'll then enter into the sumptuous residence of a noble-merchant dating from the city's golden age to talk about the mechanics of the lucrative trade with the Orient from the role of the State and the nationalization of the merchant galleys to private initiative and the birth of the joint venture. Our story will then take us to the Arsenal for a closer look at ship building when Venice was the world's mightiest sea power and then on to the magnificent Basilica of Saint Mary of Good Health to see how the city's economy changed with the expansion of the Ottoman Empire and talk about the final decline and fall of Europe's oldest republic. The guided walking tour does not include the interior visit to the Pisani Moretta home on Sunday. Price: 320.00 (U.S. dollars) for two (2) persons. Each additional adult costs $60.00. Minors under the age of 18 cost $30.00 each. 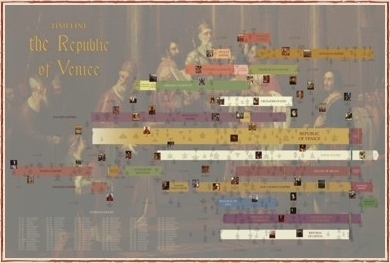 Price includes one (1) copy of Venicescapes’ timeline “History of the Republic of Venice”. Additional copies are available at $20.00 per copy. Special note: The private visit to the Pisani Moretta home cannot be confirmed prior to arrival in Venice.